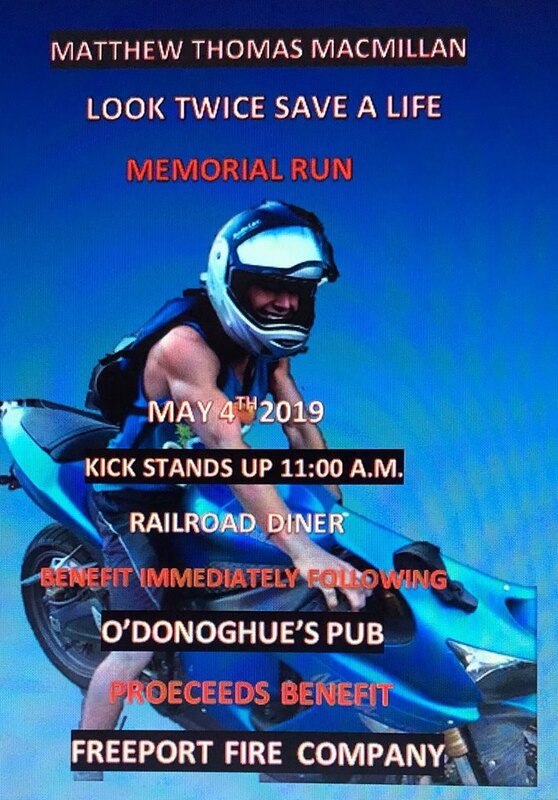 We will be having a memorial run followed immediately by a fund raising event at O'donoghues in Brunswick on May 4th which is the one year anniversary of Matthew's accident. The run will be reflective of where Matthew spent the majority of his life including passing by the Freeport Football Field where Matt played like he lived always giving his personal best. On this day we would like for all to remember to "LOOK TWICE SAVE A LIFE while also trying to do something positive for others in Matthews memory. We chose the Freeport Fire company because they contribute to important charities such as The Autism Society, Cancer Society and Special Olympics. In addition, the Freeport Fire Company provides three scholarships to local youths and sponsors a little league team every year. Everyone is welcome and we look forward to spending this day surrounded by friends and family.